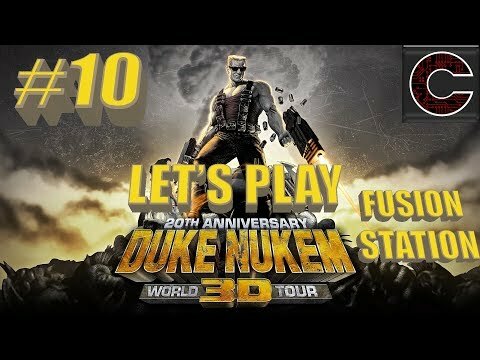 A playthrough of Duke Nukem 3D Atomic Edition (the original DOS version, not Eduke32), attempting to get every secret in the game. This is shown in High Definition. Comments: This is a good step up from the previous level with fewer sentry drones, no battlelords, and no tripbombs to speak of. 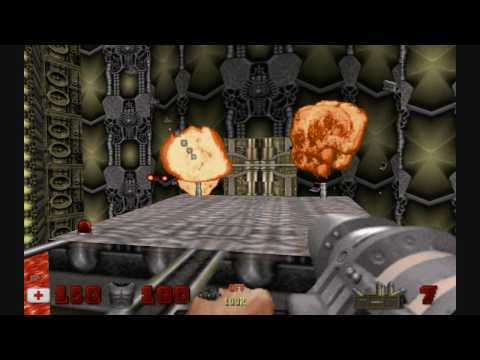 There are some explosion traps, though, but you can see them coming. It also features some cheaply-placed fat commanders at the end, too. You'll see what I mean. 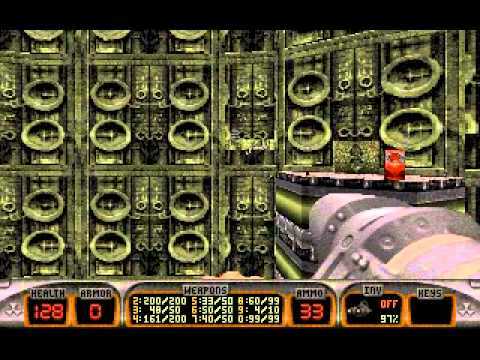 This level has 7 secrets. 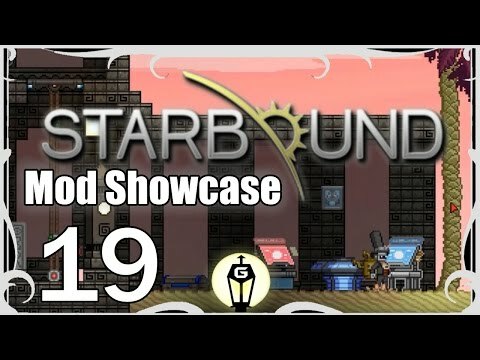 This playthrough uses no saves except between levels, and is played on Come Get Some difficulty. Secrets Shown: #1: A secret passage: 1:30 In the crusher room, there is an alcove to the opposite side of the entry elevator. Open the secret door on the area that isn't lit. 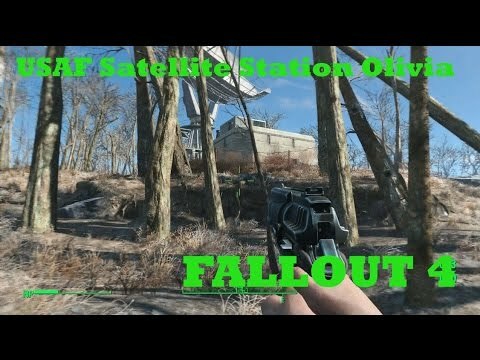 This is where you can get the Atomic Healths that this level teased you with. 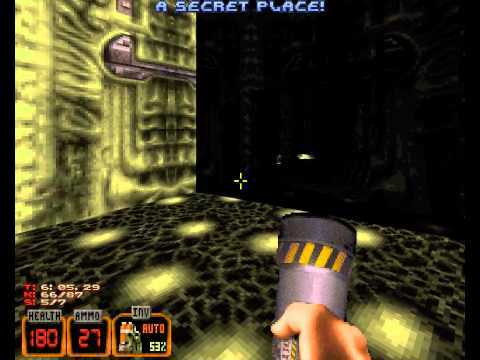 #2: A secret secret passage: 1:38 In the same secret passage, go to the left where the slimer egg is and jump up to the left for another secret passage containing pipebombs. 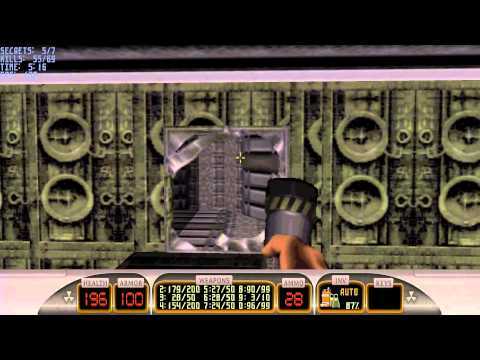 #3: A secret secret passage: 2:07 This requires some amount of bravery to get. Go to the crusher and look down in the piston shafts for a secret passage. Head there and, to the wall opposite of the shootable switch, there is some hidden ripper ammo. Don't get crushed, though. #4: Armor in the Corner: 4:04 In the turbine room, head left to the security monitor. You'll hear a door-opening sound. Time it just right, then activate the door. 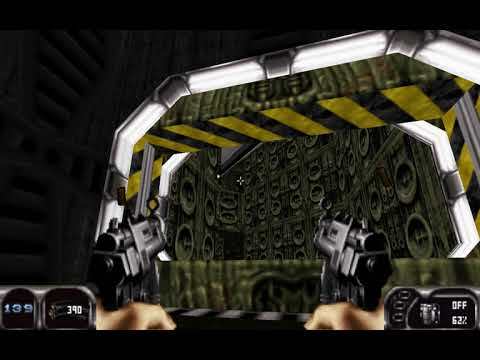 Head to the other side as quickly as possible and you'll find an alien computer terminal with some Freezethrower ammo. 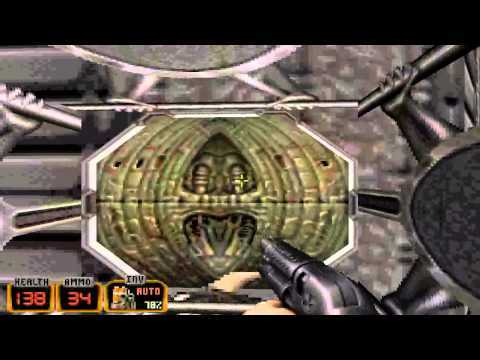 #5: Armor in the Corner: 5:16 In the slimer egg room, there is an armor hidden in a pillar in a dark corner to the right. It's a bit hard to find, though. 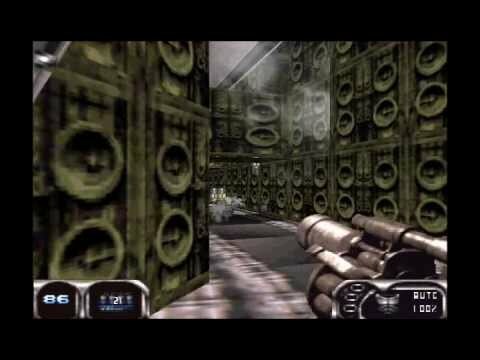 #6 & #7: Rockets in the wall: 5:33 In the Giger-esque pipe room, wait until the explosions finish, then climb up to the top of the alien pipes. 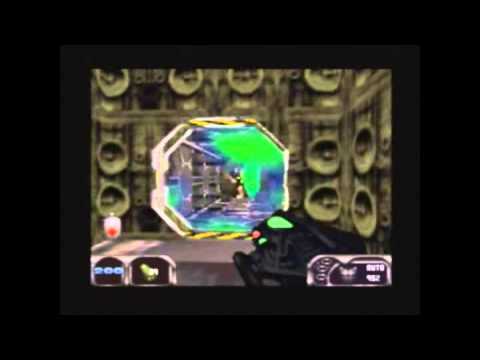 Go through the vents to trigger a secret (#6). Head to the other side to find an atomic health and a captured naked woman. Unfortunately, you have to blow her up to access the rocket ammo on the right side. 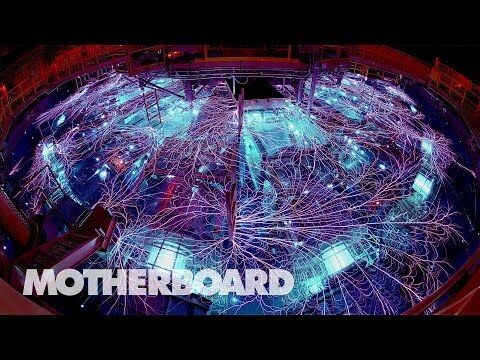 Is discovering a secret worth a person's life? Well, IS IT!? 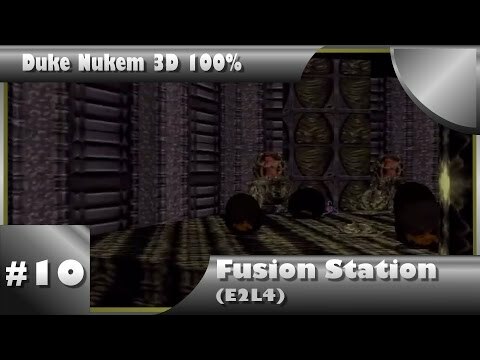 Episode 2, Level 4 of Duke Nukem 3D [20th Anniversary World Tour] titled, "Fusion Station". Played on the "Come Get Some" difficulty with 100% secrets. 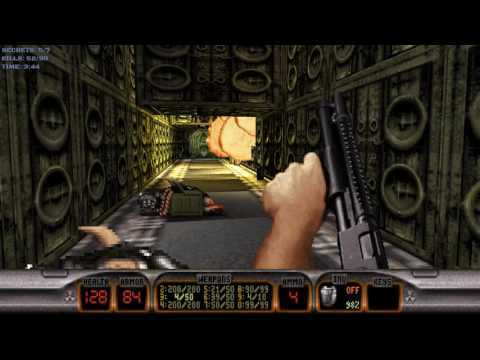 This is episode 2, Lunar Apocalypse, level 4, Fusion Station of the classic DOS game, Duke Nukem 3D Atomic Edition on the PC. Took me a while to record this video, kept dying. And yet again, awesome quality in HD! Full Resolution + HD capture is awesome. 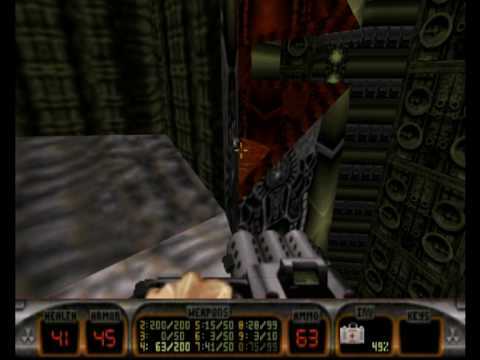 E2M4 on Come Get Some difficulty. 1080@60FPS available. 7 Secrets : #1 : 00:58 (2xAtomic Health) #2 : 01:05 (2xPipebombs) #3 : 01:22 (2xRipper Ammo) #4 : 02:34 (Freezethrower, Freezethrower Ammo) #5 : 03:18 (Armor) #6 : 03:59 #7 : 04:13 (RPG Ammo) No Access cards in this level. YO! Anotha Location cleared and this time its got the goods! 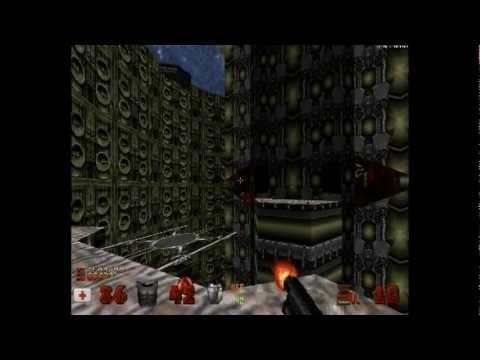 Hack Author: Mar99troid aka SpacePirateHacker54 Download: http://metroidconstruction.com/hack.php?hack_id=385 The first entry from the 2018 Post Hack Scrubs Contest! 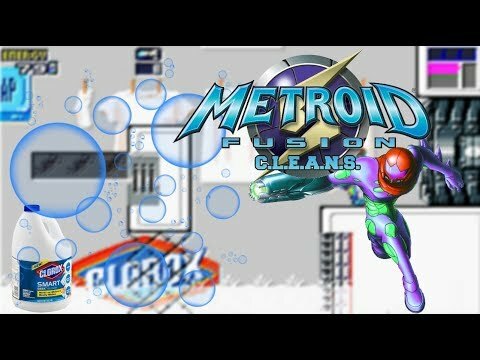 This is a lengthy Metroid Fusion hack based off a single event. Some really neat ideas and concepts went into this hack, but sadly it's terrible design decisions kept me from enjoying it like I could have. 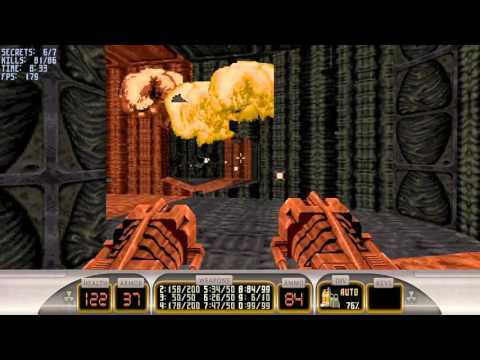 Hello this is my first try of a secret guide for the classic game "Duke Nukem 3D". I hope it helps. 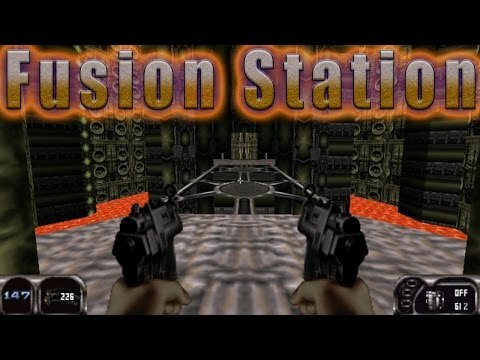 Lunar Apocalypse - Fusion Station Difficulty: Come Get Some Secrets: 7/7 No shortcuts. Filipe Paiva é apresentado como artista da Suhr Guitars, neste video tocando a musica Fusion Station do album Euphoria! 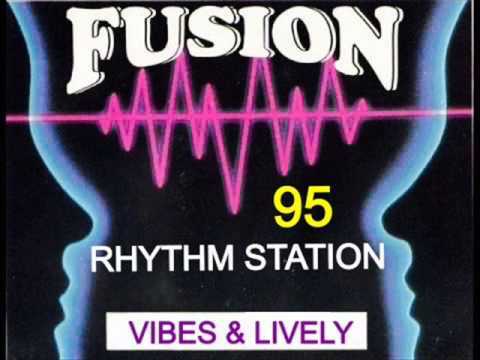 Fusion Station track number 06 from my album Euphoria! Check out on Itunes, Spotify and Deezer! Cheers! 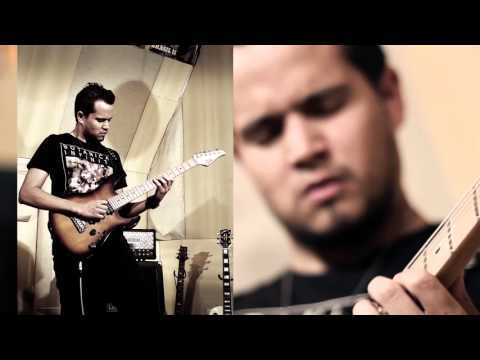 Filipe paiva is artist: Suhr guitars, Fire pedals, Tecniforte cables and Dean Markley Strings. 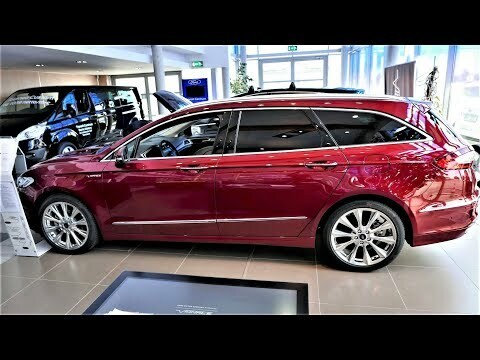 Finally I had a chance to see, and feel this Maybach ;) by Ford. Wreszcie mi się udało zobaczyć i poczuć jak wygląda Maybach ;) Forda. Prezentacja modelu, sprawdzamy różnice w jakości materiałów względem wersji Titanium. 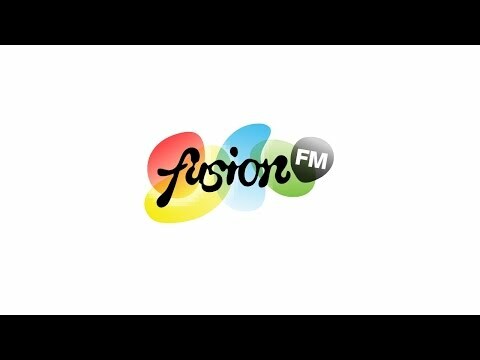 To jest popularny za oceanem Fusion, ale występuje tam jedynie w wersji sedam. Amerykanie bardzo chętnie przygarnęliby wersję kombi. 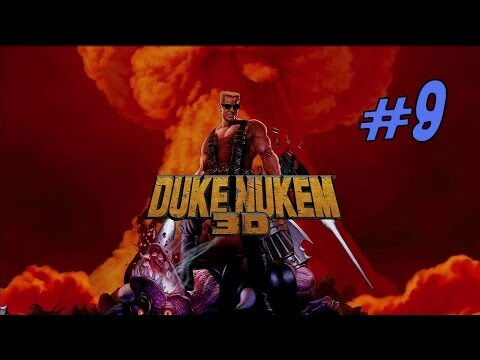 Duke Nukem 3D Episode 2: Lunar Apocalypse Level 4: Fusion Station Duke Nukem 3D is a fps by 3D Realms. The game makes its way from a kid-friendly 2D Side-Scroller to a 3D Environment with adult content. 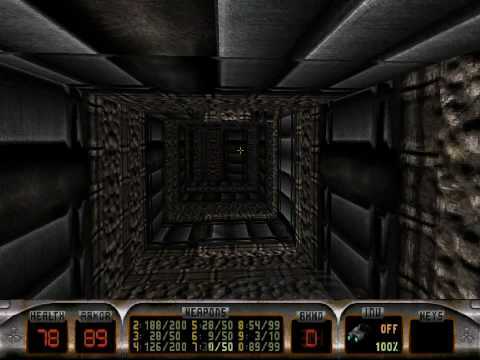 The game runs under Ken Silverman's build engine. 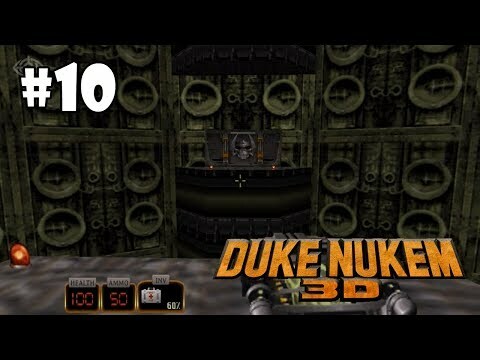 I play Duke3D with DukePlus v2.0 and a modified High Resolution Pack Episode 2 - Lunar Apocalypse Level 4 - Fusion Station Links: HRP - http://hrp.duke4.net/ DukePlus - http://fissile.duke4.net/fissile_dukeplus.html EDuke32 - http://www.eduke32.com/ Thank you all who still work on this game and the entire community behind it! 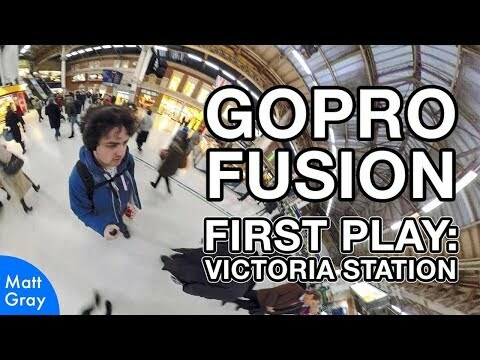 I had a play with the GoPro Fusion 360 camera while walking through Victoria Station. All the camera moves are done in post-production. Matt Gray | http://mattg.co.uk | http://twitter.com/MattGrayYes GoPro Fusion Review (It's brilliant, but flawed): https://www.youtube.com/watch?v=ShInYg-OEr4 The video comes out of the Fusion as two separate circular hemispheres. GoPro Fusion Studio took over an hour to stitch these into one 3.5min equirectangular video. I imported that into Adobe Premiere, and used the GoPro Fusion plugins to reframe the shot and export as flat video. 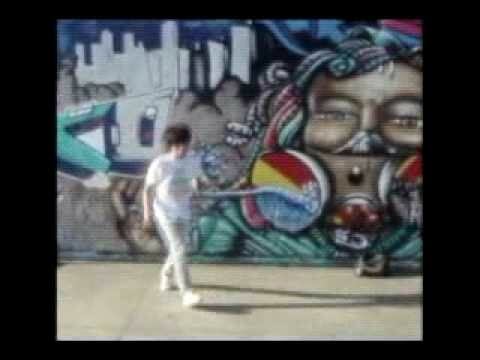 I made the music. You can download it at: http://MattGrayYes.bandcamp.com GoPro Fusion: https://amzn.to/2GHSaZg ~Kit I Use Regularly~ Sony RX100M2: https://amzn.to/2JcxQxt Snapchat Spectacles: https://amzn.to/2GQ6AXc GoPro Hero 4/5: https://amzn.to/2uEfySO DJI Osmo Camera: https://amzn.to/2JcHP64 Tascam DR-10x Audio Recorder: https://amzn.to/2pXQZun Røde NTG2 Mic: https://amzn.to/2GHS3gi Røde Smartlav+ Mic: https://amzn.to/2H1CEVJ All Amazon links are affiliate links which give me a small percentage of what you pay them as a tip for sending you their way. It doesn't cost you more. 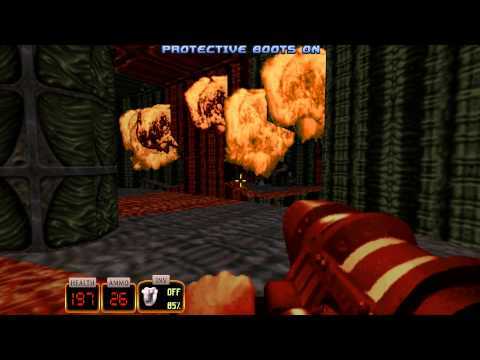 A fuse between Duke's Mighty Boot and the aliens' faces would be in order within this station. Secrets and kills are 100% cleared. 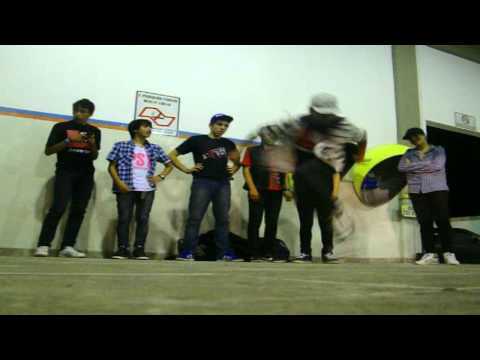 Secrets location: 1st & 2nd 01:46 3rd 02:32 4th 04:22 5th 05:59 6th 06:29 7th 07:25 For the best experience, set the video to 720p. Enjoy! 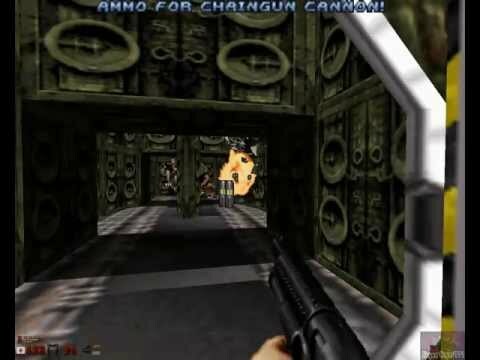 Прохождение игры (gameplay, walkthrough) Duke Nukem 3D со всеми секретами (all secrets) без комментариев (w/o comments) от ImFuryPro. Приятного просмотра! 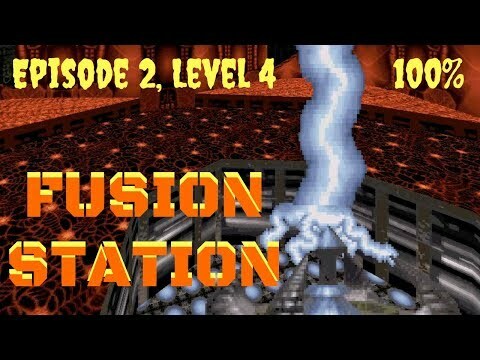 Эпизод 2 (Episode 2): Lunar Apocalypse Уровень 4 (MAP 4): Fusion Station Сложность: Come Get Some Секретов: 7/7 --------------------------------- Понравилось видео? 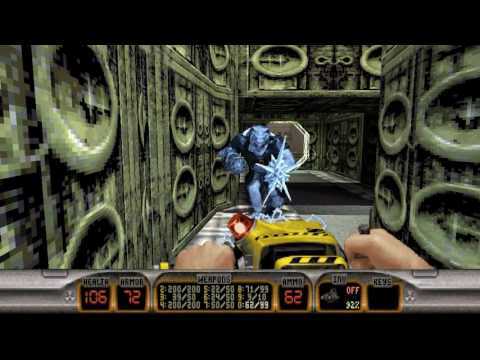 Нажми - http://bit.ly/2HFj6dw Плейлист Duke Nukem 3D - http://bit.ly/2jlHJxj Описание игры на CG - http://bit.ly/2w2DC2g Дюк Нюкем возвращается в Лос-Анджелес после событий игры Duke Nukem II. Неожиданно по радио поступает сигнал бедствия: город штурмует ранее неизвестный враг — агрессивная инопланетная раса, прибывшая с целью похищения женщин и использования их тел в качестве инкубатора. 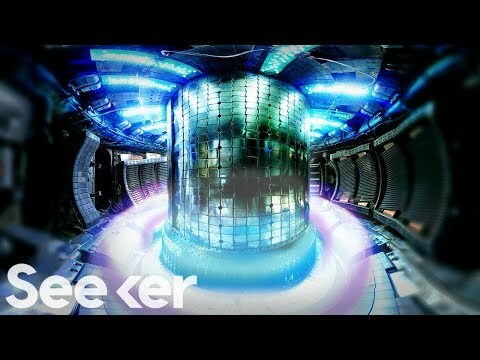 Космический корабль Дюка сбивается ракетой, но ему удаётся катапультироваться на крышу дома. Он берётся за оружие и начинает бойню, сметая горы пришельцев на пути к их лидерам. Каждый эпизод имеет свою особенность в сюжете. Секреты: Секрет 1: 1:43 Секрет 2: 2:18 Секрет 3: 2:29 Секрет 4: 3:47 Секрет 5: 5:10 Секрет 6: 5:47 Секрет 7: 6:08 ----------------------------------- Связаться с нами можно в: На сайте - http://central-games.ru ВКонтакте - https://vk.com/centralgamesru Facebook - https://facebook.com/CentralGamesRu Twitter - https://twitter.com/CentralGamesRu ----------------------------------- Спасибо всем за поддержу своими подписками, лайками и комментариями, вы самые лучшие!! !